Day 340: Crazy ciggie totem? The totem sculptures thing are just too funny. I’ve seen them around each time I go to/fro my tango classes, but I never quite figure them out. I’m also too lazy to check if there is any description of these totems nearby. 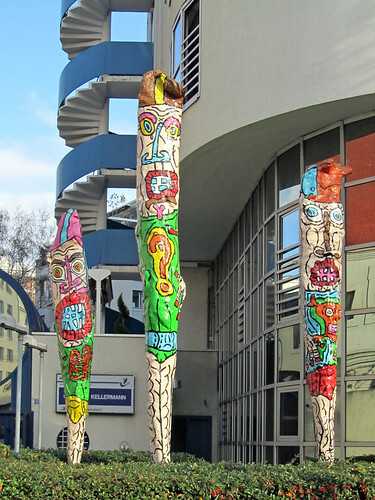 My imagination runs wild and what I perceived are some colourful ciggies in the guise of totems. And it’s not even commercial ciggies but home-rolled. I’ve finalised everything at Cité U today, handed back my keys and all. It’s so strange to see the studio apartment like how it was eight months ago. It’s as if I’ve never been there even. The cleaning lady of my floor was nice, wishing me good luck and approving that the apartment is in good order. Funny there was no état des lieux being held though. Just a quick glance through.